It is impossible to assess the total number of people engaged in fisheries in the world, due both to lack of registration and to the utilization of different definitions. In the statistics, "fisheries" may encompass not only fishermen, but also workers in fish processing on land and those involved in aquaculture. The International Labour Organization (ILO) publishes The Yearbook of Labour Statistics which relates to total employment (paid employment plus self-employment) and persons in paid employment worldwide. In this series, fisheries are generally classified together with agriculture, hunting and forestry. Consequently fishermen cannot be separately identified. The most comprehensive data of the number of persons engaged in fishing is maintained by the Food and Agriculture Organization of the United Nations (FAO), which estimates that roughly 15 million fishermen (or "fishers") are employed aboard decked or undecked fishing vessels operating in the marine capture fisheries, of whom about 98% work on vessels less than 24m in length. If part-time fishermen are included, as well as those involved in freshwater fisheries and aquaculture, the number rises to 36 million. According to FAO data (The world fishing fleet, in The State of World Fisheries and Aquaculture 1998:66-68, FAO Rome 1999), in 1995 the world fishing fleet numbered about 3.8 million vessels. About one-third of these were decked vessels, the remaining two-thirds were undecked vessels, generally less than 10 m in length. While almost all decked vessels are motorized, only about one undecked vessel in three is equipped with an engine. a. Most of the world's fishing vessels operate in Asia. The proportion of non-motorized vessels is higher in Africa (about 80%) than in any other continent, while Europe has the highest proportion of decked vessels (about 70% in 1995). In the Asian fleet, slightly fewer than 40% are reported to be decked vessels. In the last 25 years, the world fishing fleet has more than doubled both in terms of tonnage and in number of vessels. The number of decked fishing vessels went up from around 600,000 in 1970 to 1,260,000 in 1995 with a corresponding increase in tonnage from 12 to 28 million grt. The graph below shows the development of the distribution of decked fishing vessels by size from 1975 to 1995. It clearly shows that the vast majority of the world's decked fishing vessels are under 25 grt, thus falling into the category of artisanal fisheries, together with all the undecked vessels (FAO Bulletin of Fishery Statistics, No. 35 Rome, 1998). Undecked fishing vessels: The number of undecked vessels increased from about 1.5 million in the 1970s to about 2.5 million by 1990, mainly as a result of higher numbers in Asia. The vast majority of undecked fishing craft in Asia and Africa are not powered by engines. Given that decked craft are relatively few in Africa, the typical African fishing vessel is undecked and non-motorized. In Asia, the typical vessel is different, as the proportion of decked fishing craft is comparatively high. The nature of employment arrangements in fishing, which may place many fishermen outside traditional occupational accident and disease reporting systems, also contributes to this lack of information. Where recorded, injuries in fisheries may be included in the more general category of Agriculture, hunting, forestry and fishing. The ILO recommends that governments should adopt classification schemes which are convertible to the International Standard Industrial Classification of All Economic Activities (ISIC), revision 3.9 Classifying fisheries as a separate entity is warranted by the unique and dangerous working conditions, which cause more accidents than are known in any other occupation. The causes of accidents need to be identified so that preventive actions can be defined and prioritized. The word "accident" implies that the event in question is isolated and unforeseen. Indeed, some of the losses or injuries to fishing vessel and crew are regarded as unavoidable casualties of unpredictable and often treacherous working conditions at sea. Inevitably, however, a combination of circumstances and incidents lead up to the unfortunate event. 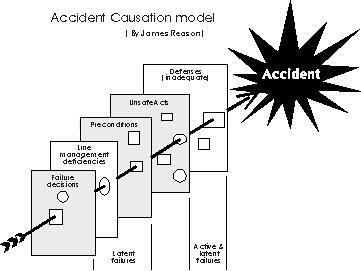 One useful way to look at why accidents occur and to emphasize the complexity of accident causation, is illustrated by "Reason's model" put forward by Prof. James Reason of Manchester University, U.K. This model looks beyond the immediate circumstances of the accident and scrutinizes the preconditions at the time of the occurrence. This may be a useful tool in identifying who should take what actions to prevent and mitigate the effect of future accidents. "In the model (see figure 2), the first layer (defences) represents defences that should mitigate the results of the unsafe act. The second layer (unsafe acts) and third layer (preconditions), include such conditions as fatigue, stress, operating practices, etc. The fourth layer (line management) includes such aspects as training, maintenance, etc. The fifth layer depicts all high-level decision-makers such as regulators, owners, designers, manufacturers, trade unions, etc. Dr. Reason suggests that these decision-makers frequently make "fallible" decisions and these resulting latent defects stay dormant waiting for someone to commit an unsafe act, and thereby trigger a potential accident scenario. If the system's defences function as intended, the results of the unsafe act are caught and the effects are limited. If the defences do not function, the accident could prove tragic. The model shows the importance of reducing or eliminating safety deficiencies. This can be represented as a reduction in the number or size of the holes, thus reducing the probability of an accident. Reason's model is particularly useful in illustrating how an accident can have a number of causes. The following is a hypothetical example, drawn up by the (ILO)-Office, of how Reason's model might be used to describe an accident on a trawler leading to the loss of a fisherman's arm: (1) the regulations in a given country do not require new entrants to fishing to receive any safety training (decision); (2) the owner does not require this either (decision), neither does he require the skipper to conduct any training on board (decision or line management); (3) at sea, an experienced crew member becomes ill and the newcomer is asked to fill in, having spent very little time on deck and having received little or no guidance (line management); (4) the vessel is operating in fairly rough conditions (precondition); (5) everyone is fatigued (precondition) and the newcomer ventures too close to the deck gear (unsafe act) and loses his balance due to an unanticipated motion of the vessel; (6) he falls into a winch not fitted with proper guards (a possible defence) and his arm is severed before there is time to stop the winch. The fisherman has lost an arm not only due to deck gear or inattentiveness but also to a series of mistakes by himself, the skipper, the owner and the regulator-all the holes in the model were aligned. The above example illustrates that measures to prevent accidents as well as to preserve the health of fishermen must be implemented at many levels. An additional consideration is how to reduce the severity of the consequences of an accident. For example, in the scenario described above, there are latent conditions and immediate actions which can mitigate the severity of the accident. The fisherman whose arm is lost faces permanent disability or even death from bleeding, shock or other causes. The latent condition "lack of training in first aid" could result in a death; conversely, immediate action by a crewmate with proper first-aid training may save a life. Achieving the appropriate balance of responsibility and action among governments, fishing vessel owners, fishermen and others is one of the major challenges involved in improving the safety record. All those concerned must consider how they can reduce the number and size of the holes". Report on Safety and Health in the Fishing Industry. International Labour Organization. Geneva, May 1999. Fishermen depend on their vessels for their survival. If the vessel is lost, it is probable that some or all of the crew will lose their lives too. The most common causes of fishing vessel casualties include capsizing, foundering, fire/explosion and collision. From the fisherman's perspective, these causes have their roots in economic pressure, luck or fate, unexpected weather lack of knowledge about the equipment fatigue and stress. 14 The design, construction, maintenance and operation of the vessel all directly affect safety and health. Risks vary with each type of fishing, the fishing grounds and weather conditions, vessel size, equipment carried and the job of each fisherman. Bad weather and loss of engine power constitute a major risk to every vessel, perhaps greater to small boats, which are more easily damaged and flooded. On larger vessels, the fishing gear and other heavy equipment pose a considerable risk of death or injury to the crew. On small vessels, the risk of capsizing while pulling in a large catch, being flooded in heavy seas, run down by a larger vessel and even attacked by dangerous marine animals can be considerable. Where harbours and shelter are not available, crossing surf may be very dangerous. Thus, different safety problems are associated with each type of fisheries. As mentioned above, the registration and classification of personal injuries varies between countries, making it difficult to compile and compare the data from different nations. However, it seems clear that the most common cause of fatality is the loss of the vessel, followed by man over board and being crushed by a heavy object. The danger of drowning in harbour is considerable too. Reported non-fatal injuries are most commonly fractures of arms or legs, injuries to the head and neck and amputations of fingers, hands, arms and legs. In addition there are a high number of injuries that are not reported, for a variety of reasons, one being that they do not lead to prolonged loss of work or form a basis for financial compensation. These injuries are obviously impossible to quantify or classify, but it is an accepted fact that they are very common and involve damages such as cuts and wounds, sprains and contusions. These health hazards seem to be accepted in fisheries, while most land-based professions would consider them as intolerable. At the ILO Tripartite Meeting in Geneva in 1999, Dr. Kristinsson, Medical Officer to the Search and Rescue Helicopter Medical Group in Iceland reported on recent findings concerning injuries in the Icelandic fisheries, which can be generally regarded as highly mechanized and technically advanced. Considerable effort has been put into reducing the risk of injuries in recent years. While there is reason to believe that fatal accidents in Iceland are fewer now than ten years ago, the same is not the case with nonfatal injuries. Every year, 10% of fishermen in general, and 15% of fishermen on trawlers are subject to injuries. Accidents involving fishermen are more common the longer they have been on the job, and there is threefold risk of a fatal accident if the seaman has been more than ten years on the job.15 Possible explanations might be that the more experienced are likely to be entrusted with the dangerous tasks and may be more prone to taking risks. Also, younger crew members are more likely to have received safety training than the older ones. This gives reason to hope that concerted efforts in improving safety education and training of fishermen may result in reduced accident rates, along with improved vessel design, construction and working conditions on board. "Commercial fishing continues to rank at or near the top of the most hazardous occupations in the United States. The spate of recent losses of lives and vessels is not unique. A few advances in the long history of attempted voluntary and regulatory safety initiatives have modestly reduced losses. However, commercial fishing vessel safety standards are lower than standards for other domestic commercial vessels, and lower than international standards for fishing vessels. There have been many attempts to raise safety standards over past decades, however, the prevailing opposition to higher standards accepts the high risks of commercial fishing relative to the cost of those standards. The solutions are basic and straightforward: seaworthy boats, competent crews, adequate survival equipment, and safety conscious resource and industry management regimes." 1 Report on Safety and Health in the Fishing Industry. International Labour Organization, Geneva, May 1999. 2 Safety and Survival Education for Nordic Fishermen. Report for The Nordic Council of Ministers, under preparation. 3 Emil Aal Dahle. A Study For "Safety Guidelines on Design, Construction and Operation of Small Offshore Fishing Boats in Sri Lanka, Bay of Bengal Project, FAO, 1990. 4 FAO, The State of the World Fisheries and Aquaculture, 2000. p. 42. 5 FISH Safety Foundation, June 2000. 6 Rafnsson, V. Health Problems and Disease Patterns. ILO Encyclopaedia of Occupational Health and Safety. Chapter 66 Fishing. Minko, V.M. On Safety and Health in the Russian Fishing Industry, paper prepared for the ILO. British Columbia Workers Compensation Board . Törner, M. et al. Analysis of Serious Occupational Accidents in Swedish Fishery. Safety Science 21, 1995:93-111. Tomaszunas, S. Work-related Lost-time Accidents in Deepsea Fishermen. Bulletin of the Institute of Maritime and Tropical Medicine, 1992; V.43, no 1-4. 7 Fishermen's attitudes towards safety. Unpublished report (in Icelandic), Fisheries Research Institute, University of Iceland, 1995. 8 IMO FSI 7/6/2 1999. 9 International Labour Organization: Note on the Proceedings of the Tripartite Meeting on Safety and Health in the Fishing Industry, Geneva Dec 1999. 10 MacDonald, J.M. & Powers, G.D. Proceedings of International Symp. on Safety and working conditions aboard fishing vessels. Université de Québec, Rimouski, 1989. 11 IMO, MSC 69/INF.10 Seafarers fatigue: Wake up to the dangers.IMO, MSC 69/INF.15 Fatigue, groundings and collisions. 12 Lloyd's fleet statistics 1996. 13 Rayment. P. & Fossi A. Report into the Safety and Security of the Artisanal Fishermen of Senegal, a joint SSG and CCFD Mission, July 1994. 14 Acheson, V. Fishermen's Attributed Causes of Accidents and Implications for Prevention Education, IFISH Conference, 2000. 15 Kristinsson, S. MD Search and Rescue Helicopter Medical Group, Iceland, in International Labour Organization: Note on the Proceedings of the Tripartite Meeting on Safety and Health in the Fishing Industry, Geneva, Dec 1999.